Microwave chocolate and Country Crock® Baking Sticks in medium microwave-safe bowl at HIGH 1 minute or until chocolate is almost melted; stir until smooth. Stir in liqueur. Refrigerate 1 hour or until firm. 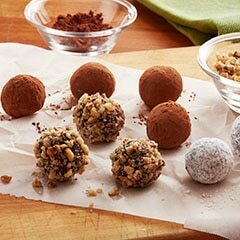 Scoop chocolate mixture by level tablespoonfuls and roll into balls, then roll in nuts. Store in airtight container in a cool place or refrigerate. Or, freeze up to 2 weeks.